My attention was drawn to the college sports yesterday, after news surfaced that a report commissioned by the Big Ten Conference recommended the league add a 12th team. At the heart of the issue is the roughly $22 million each school receives annually from revenue-sharing television broadcast contracts (the Big Ten Network and others). The report was commissioned to ensure that adding one of the five possible schools - Notre Dame, Missouri, Syracuse, Rutgers, or Pittsburgh - would not lower the league's annual revenue pool (the highest among the NCAA's six BCS conferences). In the end, the report found that the Big Ten would retain their high revenues by adding any of the five studied schools. A source inside the league told the Chicago Tribune that, "we can all get richer if we bring in the right team or teams." However, it appears that Rutgers is the early leader for an invitation because of its ability to access the New York media market as well as its recently-renovated stadium (to the tune of $102 million). The deal would be a slam dunk for Rutgers: accepting an invitation would quadruple the annual revenue it earns as a member of the Big East Conference. Currently, there is no timetable for extending an invite. But, as I often venture into the absurd, there was some other news coming out of the Big Ten that caught my eye yesterday. Specifically at Purdue University - home of the Boilermakers. 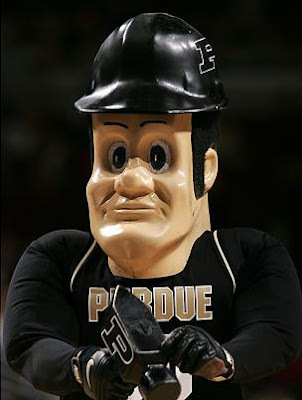 The University's unofficial mascot since 1956, Purdue Pete, is getting an makeover. While the mascot has endured slight changes and updates since its inception, this latest update will be more of a wholesale change. ...well, on second thought, yeah. 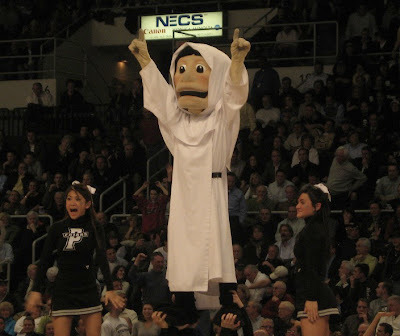 Why change something as sacred as a mascot? Plain and simple: he's scaring the children. 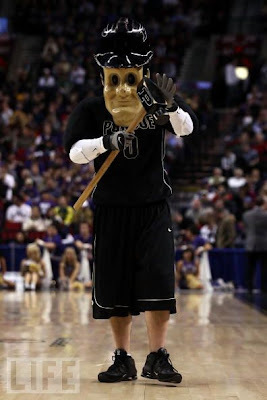 From Purdue athletic director Morgan Burke: "Look, I'm the one who gets the phone calls from parents who say that big face scares their 3-year old. It's been 25 to 30 years since he got a makeover. At some point, the poor old guy has to come into the 21st century." Don't let Pete near your officially-licensed Wilson footballs. 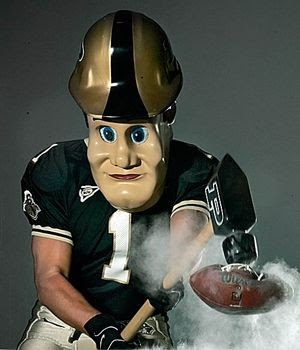 Terri Lucie Thompson, vice president of marketing for Purdue, says that Pete's eyes and mouth are the problem: "He has a very square jaw and kind of cleft chin. Does that stay? The fear could be coming from his eyes." You think? 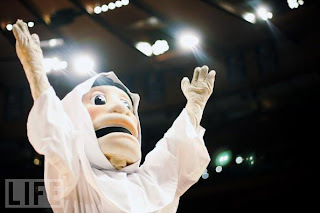 Anyway, this story got me thinking, which other schools have scary looking mascots that could afford to be updated? How about a countdown? Blank stare? Check. Creepily-oversized smile? Yikes. At number two: the Stanford Cardinal. I'd rather my psycho trees avoid contracting rabies. 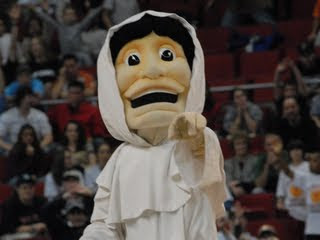 And, finally, number one: the Providence Friar. but I'm as scared as the cheerleader on the left. Ok, now I probably won't be able to fall asleep tonight. Well, that was both fun and completely terrifying. 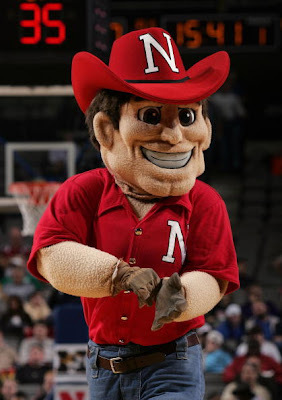 I'd be happy to take any other mascot suggestions. Of course, if the University of Mississippi ends up adopting Admiral Ackbar as a mascot, he'd be in consideration for this list. By the way, NPR interviewed the leader of the Ackbar movement yesterday, during "Morning Edition." 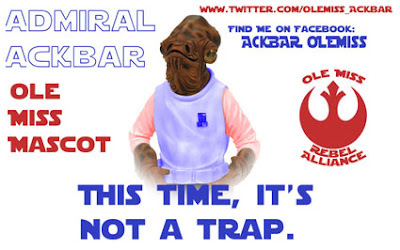 Almost as impressive as the Ackbar mascot Twitter page. Seriously. Well done, Ole Miss, well done. Whaaa!? 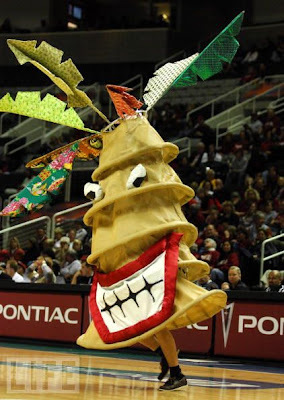 The Stanford Tree, scary?! No way! Are you interested in (World) cup size upgrade? Can new stadiums propel an entire league? The Tampa Bay Rays' Night Club? Has the NBA co-opted remix culture?